One of the most remarkable things about digital technology is the number of different file formats that are in use for similar purposes. For instance, images are often in GIF, JPEG or PNG format, video in MPEG or AVI and sound files can appear in MID, WAV, MP3, OGG, FLAC and many more. The reason for the different formats is that each one offers something different (for instance, GIFs are particularly suitable for two-tone images) and this difference led to the success of MP3, a compressed sound file format. A single three minute MP3 file is much smaller than the same three minute file in WAV format, for instance. However with compression comes a loss in quality, something that FLAC doesn’t possess. FLAC stands for Free Lossless Audio Codec. It is a royalty-free and open codec that compresses audio so that no data is lost (hence lossless). In contrast, MP3 is lossy, meaning that certain information is unavailable in the uncompressed audio data. This can be heard in low-bitrate MP3 files, where louder or “busy” sections of music tend to sound messy. With FLAC audio you can enjoy music the way it was meant to be heard on CD, with all of the audio elements intact. There are many FLAC players available for desktop platforms; one of the most common is VLC from www.videolan.org, and more and more players are coming with FLAC playback capabilities. While Apple offers the AAC lossless format, FLAC is considered a more flexible format and isn't limited by DRM. In order to listen to FLAC audio files with iTunes, you need to employ some additional software. The most popular choice is Fluke, available from www.macupdate.com. 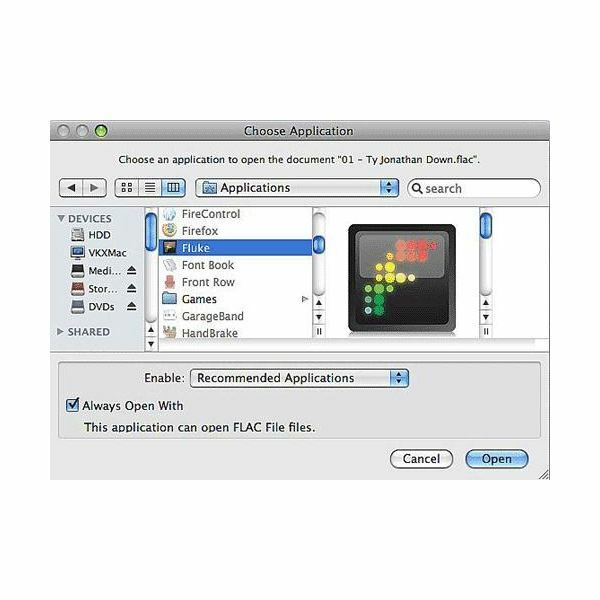 Once installed, find a FLAC file on your computer, right-click and choose Open With > Other. Choose Fluke in the next box and tick Always Open With – then click Open. The utility will then ask you if you want to import the files into iTunes, and after agreeing to this your FLAC tracks will be ready to listen to! For Windows users, FLAC audio is not available on iTunes – you will have to stick to traditional Windows audio solutions. Once your FLAC audio tracks are imported into iTunes you will be ready to enjoy them. If you’re ready to do this – stop. You’ve just spent time importing FLAC audio into iTunes. The question is – does your Mac have good enough audio capabilities to play back FLAC in a satisfactory manner? Whether it is FLAC-capable (it clearly is) is not the issue here; after the efforts you have gone to you need superior audio playback equipment – loudspeakers, basically – to take advantage of FLAC. While a standard MacBook or iMac comes with good audio reproduction and speakers, these are designed for desktop areas. To fully appreciate the enhanced audio available with FLAC, you should consider purchasing some superior computer speakers.